MAP is an itinerant outpost for cultural + economic + political exchange taking residence in public markets throughout Southern and Baja California. Through a series of collaborative in-site workshops, performative actions and artistic interventions, the project invites publics to consider the parameters by which citizenship is/can be (re)constituted in a moment when national boundaries like the US/Mexico border are simultaneously erased by economic policies and bolstered through anti-immigrant criminalizing policies. The second iteration of the project, MAP:TJ took residence within the Mercado Sobreruedas Pancho Villa in Tijuana during May 2017. During this more research-focused iteration of MAP, we collaborated with Universidad Autónoma de Baja California Professor Christian Zuñiga, and students from the departments of Art and Communication. Like the iteration of MAP in Los Angeles, we facilitated a series of research exercises, analyzing the logics and space of the market, after which students were invited to develop interventions reflecting on dynamics they experienced. ​To activate the interior of the trailer further, we conducted and recorded interviews with Tijuana-based researchers Geovanni Zamudio, and Carolina Garcia, whose work focuses on public markets in the city Tijuana. Pepe Rojo of the Comite Magonista Tierra y Libertad was also invited to host a pirate-radio broadcast from the trailer, featuring the reading of political manifestos and poetry. To conclude, a series of “Magonista” flags crafted in the space, were used as banners in a procession through the market. One of MAP’s intentions is to collaborate with immigrant-rights groups to facilitate workshops within the market. For MAP: LA, we worked with Orange County- based RAIZ (now called Resilience Orange County), a chapter of the Immigrant Youth Coalition, and members of the Spurgeon Intermediate School Social Justice Club, to design + facilitate a workshop on the aesthetics of protest in the Santa Fe Springs Swap Meet. Participants were invited to articulate their political demands on mylar balloons in response to the political rally cry “What do we want?” as immigrants/youth of color/latinxs/chicanxs/etc. To conclude the workshop, a march was undertaken through the market flying the balloons in place of picket signs. The workshop was also facilitated as part of MAP:TJ in collaboration with the Comité Magonista Tierra y Libertad. During both interventions some participants took their balloons with them to carry through the market and back to their communities, while others chose to leave their balloons as part of the MAP archive. What do we mean when we speak of America today, in the age of “Make America Great Again”? We posed this question to publics within the Santa Fe Springs Swap Meet and the Sobreruedas Pancho Villa, who were invited to respond to cartographic images of the US, the continental Americas, or the Mexican soccer team “Club America”. Participants were given three small “party poppers”—that are sold widely in these markets—to throw at the image(s) that corresponded with their understanding of “America” and discuss their choice(s). Throughout the course of our time working in the market, each image began accumulating marks creating a collective drawing of sorts, registering identifications/understandings. 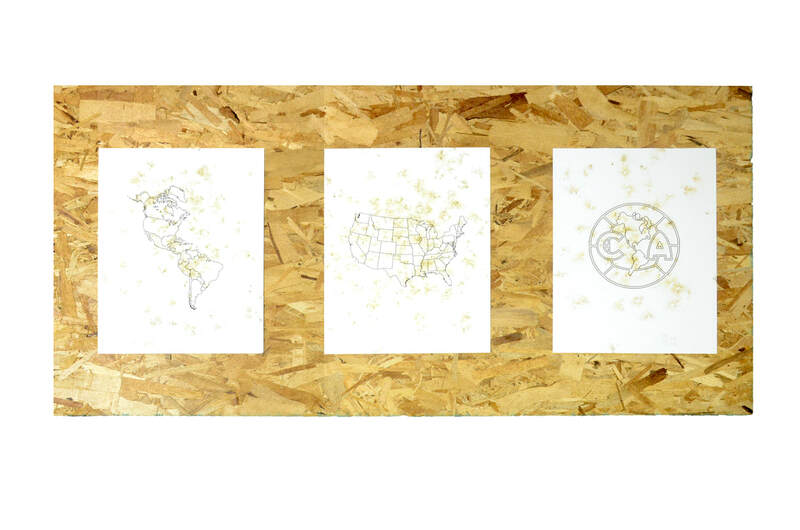 Each of the images offers a paradigm for the construction of collective identities, and ultimately of citizenship as established and sustained by either a relation to and legibility for a geo-political state structure (US), a connection to a region/land and shared/common history (Continents), or a connection maintained through participation in a social/cultural practice (Soccer team). The project was undertaken in both the Los Angeles and Tijuana iterations of MAP.